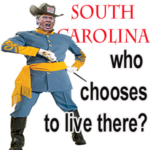 Don’t they know any Latin in South Carolina? May 28th, 2018 - 2:04 am § in Misc. 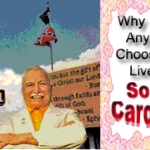 South Carolina: How to tell a Lady KKK from a Guy KKK? Answer ..she is wearing the sash! October 8th, 2017 - 4:17 am § in Misc. SUNDAY REVELATIONS: The Lord is warning us. October 1st, 2017 - 12:23 am § in Misc. Why Does Anyone Choose to Live in South Carolina? July 2nd, 2017 - 12:19 pm § in Misc. July 2nd, 2017 - 1:02 am § in Misc.